He lifts his tired head from the pillow, and stares out at the rain. He wonders if this is just the gods' way of washing off the ruins of Caelondia. He used to like the rain, long time ago. Now it feels wet and dark, like an ornery ol' Scumbag. He gets up. At his desk he starts writing a intro, a real slick parody of Bastion's narration. It's a real cliché at this point to start a Bastion post with narration, but he does it anyway. He doesn't know what else to do. Not since the Calamity. It's a bit of a rough patch here at Backlog Journey at the moment. On one hand, the massive onslaught of holiday sales is gone (which proved just too onslaughty for me to manage) and it's left me with an untidy mess of possibilities. On the other, January brings a new semester and a big old course load. Despite that, it seems like a good time to dip into the backlog, but adding to the mess is my recent utter lack of time to play any games over the last few days, making it a little hard to come up with topics and theories for an update. Things seem pretty hopeless at this point. But then, past the break, he finds the Bastion. Lucky for me, I played a lot of Bastion. I managed to finish it too, making this semi-indie RPG the first leg of my little journey. 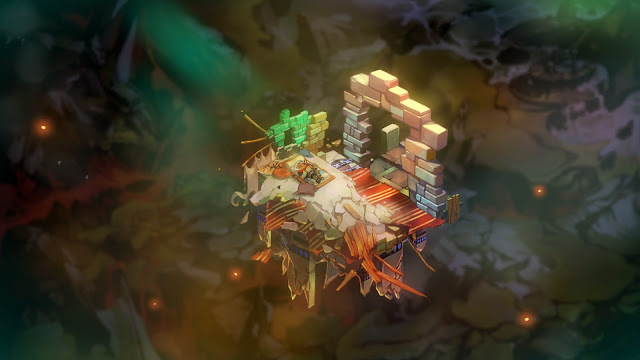 Bastion is one of the bigger surprise hits of recently departed 2011 because it seemed to come out of nowhere, and it managed to be one of the most original games in years despite the constant themes of looking at the past. 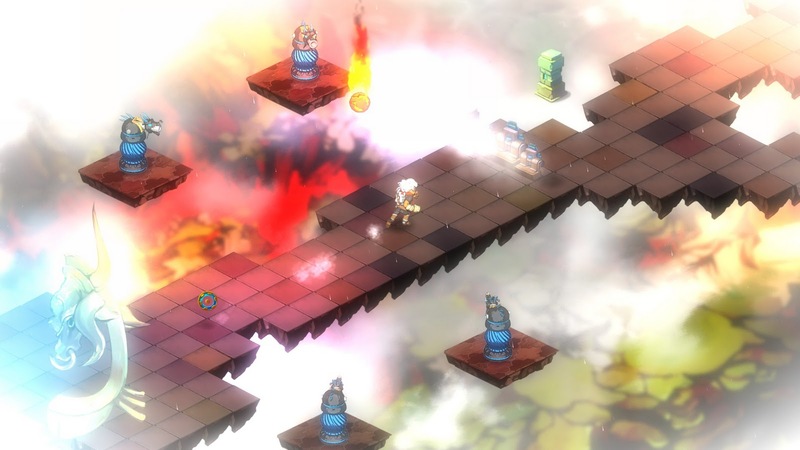 Bastion is the tale of the Kid, who woke up to find his home nation of Caelondia to have been completely enveloped by a mysterious event known as the Calamity. Luckily, there's a safe haven known as the Bastion that just needs a few repairs, so off goes the Kid across the broken floating fragments of the land. It's telling when I can honestly say that the weakest part of the game is the gameplay, and even then it's still really good. The gameplay feels like an isometric take on the classic top down Zelda games; you equip two weapons an an ability, and fight your way past monsters and other hazards. The controls are rock solid with an Xbox controller and still acceptable on a mouse and keyboard set-up, although running diagonally is aggravating on a WASD set-up. Combat is fun, fluid and very skill oriented, with blocking and counters and a wide variety of creative enemy types. The only reason the gameplay didn't completely astound me is purely because it doesn't consist of much more beyond combat, with very few elements to switch things up (though there are a few; running down collapsing platforms while the district is destroyed comes to mind). The gameplay is definitely fun, but it essentially serves as a vessel to deliver the story. There are three particular elements in Bastion that become immediately obvious as "selling points" the second you start the game: the artwork, the soundtrack and the narration. The artwork is excellent; many people compare the visuals to paintings but I find it more resembles a well illustrated storybook. Breaking free of the beloved brown and grey apocalypse template, Bastion's post nuclear world is full of vibrant colours and otherworldly floating landscapes. My intense love and adoration for the soundtrack is very well trod territory by now (this is one of two games I purchased the soundtrack long before ever buying the game). It's twangy and western and modern and electronic and just different all in one package. It's a perfect blend of acoustic performances with modern sound mixing influence and remixing, and I can't get enough of it. Then there's the narrator, consisting of Mr. Logan Cunningham's excellent performance as Rucks. Rucks's dulcet tones are your constant companion through the game; he provides exposition, guidance, story progression, dialogue and a few well timed jokes all in one. While I can't say the trope of the narrator telling the story is completely original—see Monkey Island 2, Prince of Persia: Sands of Time, Borderlands and many more—it is one of my favourite ways to present a story, and Bastion's dynamic narration goes well beyond any of the previous examples. The story swipes quite a few familiar video game tropes, but the way the story is presented through Rucks, music and visuals gives it the proper impact and elevates things to a wholly original level. Obviously I can't do much more than heartily recommend that you find a place in your library for this incredible game. So instead, I want to talk a bit about the themes of Bastion. While the great narration and beautiful visuals get the majority of the attention, my favourite part of the game is the way the theme of nostalgia and longing is implemented into every facet of Bastion's release. The examples are endless; the narrator often brings up solemn soliloquies on the history of each district in Caelondia you visit, and the lost people. The Kid is tasked with gathering fragments, shards and missing cores. Even the soundtrack fits into this model; the opening track consists of Rucks ruminating on the lost music of Caelondia. So it's pretty clear Bastion is coming from a position of longing for the past. This also, in a weird meta sort of way, informs how the game itself is designed. There are plenty of common video game tropes in the gameplay and story; there's the aforementioned classic Zelda influence, most of the main gameplay elements, the post apocalyptic world, the lone silent protagonist and dozens more. All of these seem to point towards the very game mechanics themselves mourning for the golden days of video games. Except maybe not so much. Mild vague spoilers below! Skip to the last paragraph if you want to play completely blind. If you're still reading, you know that towards the end of the game you are offered two options; one choice revolves around preserving history, and the other involves letting go. It seems at first like preserving the past is the honourable self sacrifice thing to do, and letting go is the selfish route. But if you've played both endings, you know that it's almost in reverse. The message seems to be that it's important to remember the past—the good, the bad, the victories, the regrets—but trying relive it prevents one from moving on. Ok, so why am I bring up the ending of a game for a review? Seems kind of backwards, right? Well, as the title says, ain't so simple with this one. 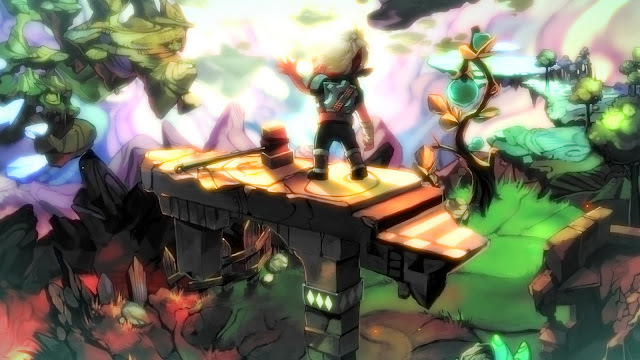 The reason Bastion is such a good game is because the game replicates the story's philosophy; the team at Supergiant respects the video games that came before it, and even repurpose many past elements from them, but yet they also manage to create one of the most original releases of 2011. The originality seems to come from the way they manage to repurpose elements from video games of yore without getting completely swamped with reverence and nostalgia; Supergiant respects the past they're building on, yet they're willing to let go and help video games move forward as an artistic medium. The best way I can characterize the soundtrack is a mish mash of different genres and styles repurposed to create an original style that can't really be compared. Its pretty easy to see that last sentence could apply to the game as well. 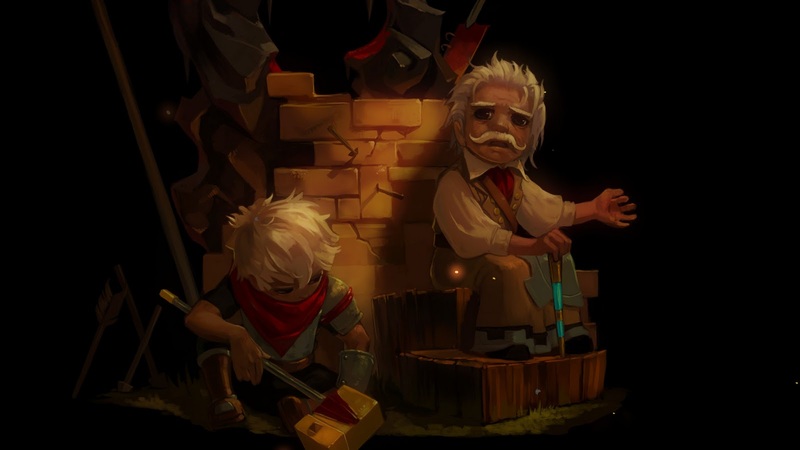 Therefore, the choice to let go and the subsequent ending makes it seem like Bastion is a call for other developers to stop replicating the past and bring fresh new experiences. It's hard to explain without completely ruining the ending, but I'm hoping that the folks who have already finished it get what I'm getting at. But that's my interpretation of the whole thing, which is why I like Bastion so much. I tend to rate games based on how well they accomplish their goals. Bastion's goal seems to be an attempt to honour yet also to let go of the past and move video games forward as a medium. A worthy goal, and a very excellent job at accomplishing this. Congrats to the team at Supergiant, you deserve every bit of praise. Not sure if I agree the story was talking to other game developers..I sorta saw it as a anti-war message. The song, build that wall, could be talking about Mutually Assured Destruction from a biased point of view seeing as who the singer was...And then the whole point of the story was you can either forgive and move on...Or keep fighting the same battles. Oh, I definitely agree about the anti-war message in the story, and I'll admit that it's unlikely the entire game was only trying to reach game developers. What I was more trying to get at was the way Bastion's message and the originality tie so close together, and that was a more indirect (and probably unintentional) commentary on the role of games as a whole. It was hard to express what I meant without spoilers! I'll definitely send you an email when I get a chance, and hopefully expand on what I mean. Thanks for reading, and glad you enjoyed it!